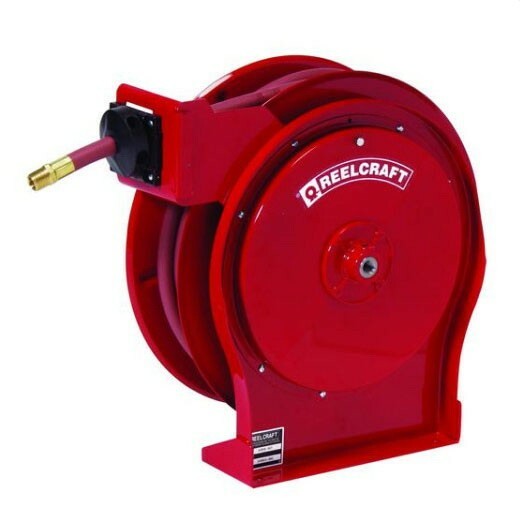 Reelcraft's 5630OMP 3/8"x30' all-steel construction oil reel is ideal for wide range of applications where critical space is required. Comes with a 30' hose. 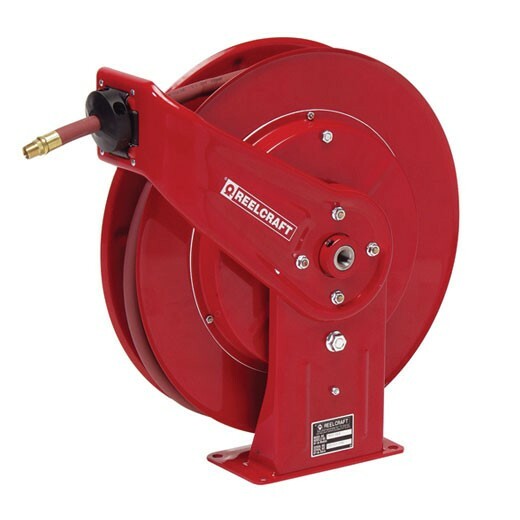 Reelcraft 7650OMP 3/8"x50' high-grade steel construction, heavy duty oil reel is ideal for the most demanding applications. Comes with a 50' hose. 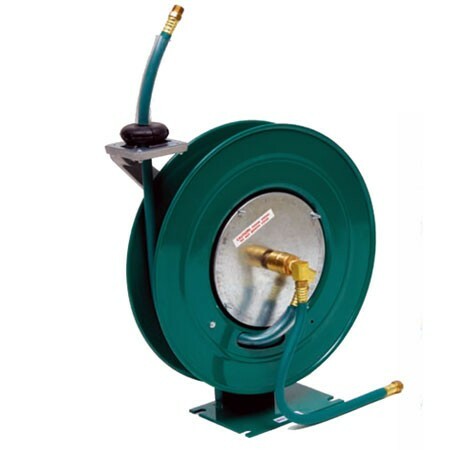 Duro Reels 1422 is a 3/8" X 25' Standard Duty Oil Hose Reel with Hose. Ideal for service station, garage, tire centers or factory where orderly dispensing of water or compressed air may be required. Duro Reels 1423 is a 3/8" X 40' Standard Duty Oil Hose Reel with Hose. Ideal for service station, garage, tire centers or factory where orderly dispensing of water or compressed air may be required. Duro Reels 1425 is a 1/2" X 40' Standard Duty Oil Hose Reel with Hose. Ideal for service station, garage, tire centers or factory where orderly dispensing of water or compressed air may be required. 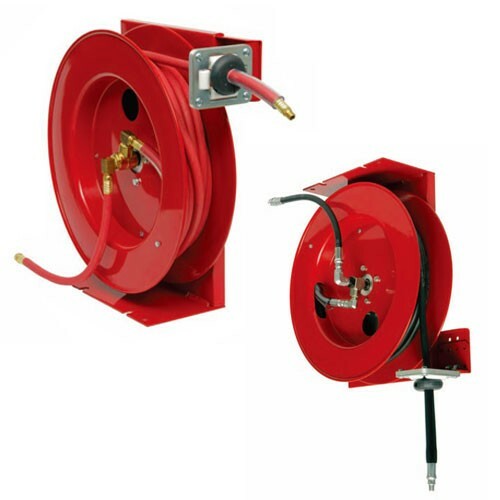 Duro Reels 1424 is a 1/2" X 25' Standard Duty Oil Hose Reel with Hose. Ideal for service station, garage, tire centers or factory where orderly dispensing of water or compressed air may be required. Duro Reels 1216 - 3/8" X 25' Heavy Duty Oil Hose Reel is ideal for large service areas where longer hose lengths are required. Duro Reels 1217 - 3/8" X 35' Heavy Duty Oil Hose Reel is ideal for large service areas where longer hose lengths are required. Duro Reels 1218 - 3/8" X 50' Heavy Duty Oil Hose Reel is ideal for large service areas where longer hose lengths are required. Duro Reels 1219 - 1/2" X 25' Heavy Duty Oil Hose Reel is ideal for large service areas where longer hose lengths are required. Duro Reels 1220 - 1/2" X 35' Heavy Duty Oil Hose Reel is ideal for large service areas where longer hose lengths are required. Duro Reels 1221 1/2" X 50' Heavy Duty Oil Hose Reel is ideal for large service areas where longer hose lengths are required. Duro Reels 1302 - 3/8" X 30' Heavy Duty Oil Hose Reel is ideal for large service areas where longer hose lengths are required. Duro Reels 1306 1/2" X 30' Heavy Duty Oil Hose Reel is ideal for large service areas where longer hose lengths are required. Duro Reels 1304 - 3/8" X 50' Heavy Duty Oil Hose Reel is ideal for large service areas where longer hose lengths are required. Duro Reels 1308 - 1/2" X 50' Heavy Duty Oil Hose Reel is ideal for large service areas where longer hose lengths are required.